The blues comes in many hues, they say; and this collection certainly proves the point. These are not just the requisite laments over life's trials and sorrow... there's joy, defiance, and ultimately a declaration of independence. 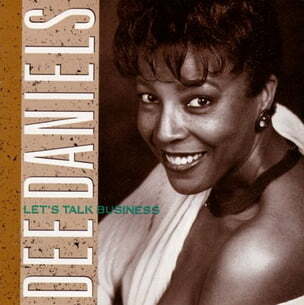 Review: A passionate blues singer who is greatly influenced by jazz as well as gospel, Dee Daniels doesn't hesitate to wail and let it rip on Let's Talk Business. This rewarding CD finds Daniels enjoying the solid jazz backing of pianist Larry Fuller and the leaders of the Clayton/Hamilton Orchestra – Jeff Clayton (sax), brother John Clayton (bass) and Jeff Hamilton (drums) – and their sense of spontaneity is a definite asset on everything from Lou Herman's familiar "The Right Time" and Percy Mayfield's "Please Send Me Someone To Love" to Daniels' own "Let Me Love You Tonight." One of the album's most enjoyable surprises is Jimmy Reed's "Baby, What You Want Me To Do" – while Reed had a laidback, relaxed vocal style, the big-voiced, emotional Daniels digs into the song in a very aggressive way. This obscure, little-known release is definitely worth trying to find. Review: For those who were disappointed with Ernestine Anderson’s last album, here is another Seattle-based singer who bids fair to establish herself in the upper echelons. She writes good songs (among them the title tune and “I Set Myself Free.” Both in collaboration with her bassist, John Clayton), does fresh things with old ones (from “The Battle Hymn of the Republic” to “Please Send Me Someone to Love” and the too seldom heard “Inchworm”), with stalwart help from Jeff Clayton on sax and Larry Fuller, a 24-year-old pianist from Art Tatum’s home town, Toledo, O. Daniels shows expertise, soul and ability in this often blues-bound set. Review: A passionate blues singer who is greatly influenced by jazz as well as gospel, Dee Daniels doesn't hesitate to wail and let it rip on Let's Talk Business. This rewarding CD finds Daniels enjoying the solid jazz backing of pianist Larry Fuller and the leaders of the Clayton/Hamilton Orchestra - Jeff Clayton (sax), brother John Clayton (bass) and Jeff Hamilton (drums) - and their sense of spontaneity is a definite asset on everything from Lou Herman's familiar "The Right Time" and Percy Mayfield's "Please Send Me Someone To Love" to Daniels' own "Let Me Love You Tonight." One of the album's most enjoyable surprises is Jimmy Reed's "Baby, What You Want Me To Do" - While Reed had a laid-back, relaxed vocal style, the big-voiced, emotional Daniels digs into the song in a very aggressive way. This obscure, little-known release is definitely worth trying to find.